Carissa Tinker of Bar Harbor, a member of the Maine Student Action Network, center, along with over a dozen others, rose to her feet and pulled out signs during Wednesday night's town meeting at the Ramada Inn and Conference Center in Lewiston. LEWISTON, Maine — Gov. Paul LePage spent more than an hour and 20 minutes with about 100 Twin Cities’ residents Wednesday, in a conversation that touched on everything from taxes to his possible political options. “They must be rich college kids,” LePage said as the group was escorted from the banquet hall by his staff and security. 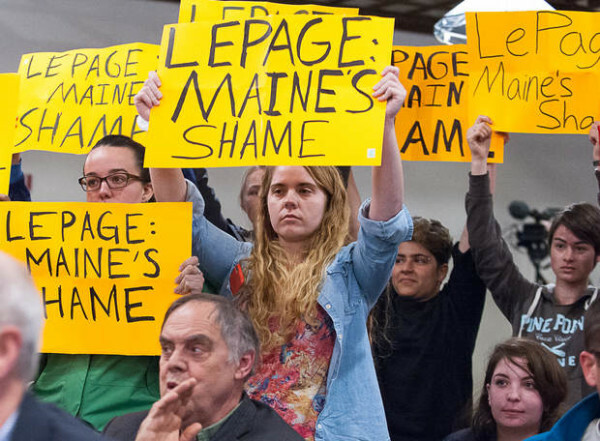 Last week, LePage appeared more irked and resorted to calling a pair of University of Maine at Farmington students “idiots” when they held similar signs during a silent protest on that campus. LePage on Wednesday repeated his intention to run for the U.S. Senate against Maine’s independent U.S. Sen. Angus King, but only if he wasn’t already serving in a Donald Trump administration, provided the presumptive Republican candidate were elected president. LePage added one disclaimer about running for the U.S. Senate: His wife, Ann LePage, would first have to agree to the campaign. He said that so far, she wasn’t convinced it was the best idea, and more than anybody else she had sway over him, he said. LePage also continued his 6-year-long broadside against the state’s newspapers, saying the good work his administration had done on a range of issues was frequently overlooked as he accused reporters and editors of making up facts. But overall, LePage remained relatively composed and civil, even telling those in attendance he didn’t always disagree with rival Democrats and then hesitatingly offered praise to three well-known Democratic lawmakers. LePage said Rep. Barry Hobbins, D-Saco, and Sen. Bill Diamond, D-Windham, were good lawmakers who acted in the best interests of their constituents and the people of Maine. He said long-serving state Rep. John Martin, D-Eagle Lake, wasn’t a lawmaker he often agreed with on an ideological level. “But if I want to get something done, I call John Martin,” LePage said. LePage said he didn’t want to say anything too nice about the men, however, because their own party might turn on them. LePage urged those attending to hold candidates accountable regardless of their party affiliation. He also listed what he sees as key accomplishments of his administration, including a recent act that provides funding to create a 200-bed mental health and drug-addiction treatment facility at the state’s prison in Windham. LePage also touted a law change that tightens the state’s prescription monitoring program, requiring stricter limits on the amount and frequency with which opioid drugs can be dispensed to certain patients. Nearly 75 percent of the state’s opioid overdose deaths are attributed to pills, according to data from the state’s medical examiner, while the smaller portion of the growing number of overdose deaths in Maine involve illegally obtained heroin and fentanyl. Answering a question from an audience member, LePage said the media widely omitted key provisions of the new law that didn’t constrain physicians from providing larger or more regular doses of opioids to those with a terminal illnesses or other specific conditions that warranted that type of treatment. The state’s newspapers didn’t report the good his administration did, LePage told the audience, from welfare reform to the creation of a program that covers tuition for University of Maine students with a tax credit for their employers who pay off an employee’s student loans on a 1:1 basis. “You won’t read about that in the newspapers,” he said. Chris L’Hommedieu, a local attorney and self-described liberal, challenged LePage to be more civil in his discourse and to set the tone as a leader of the state in a way that would make Mainers proud. L’Hommedieu said he didn’t agree with the protesters who were asked to leave the event, and he also didn’t believe LePage was a racist, as some of his opponents have claimed. But L’Hommedieu said he hoped that as a leader, LePage would treat all of his constituents with civility and fairness, regardless of whether he believes the same things they believe, he said. “You’re the leader, and I would just ask you to bear in mind that this is the face of someone who you say pretty mean things to, and I pay your bills; I pay your salary,” L’Hommedieu said. He said he meets every Saturday with Maine residents in Augusta and he never asks what party they belong to.